I decided I didn’t want to do ANY cooking on Christmas Day. So as we watched the atrocious Carols by Candlelight tonight, the amazing aroma of cooking turkey wafted downstairs. 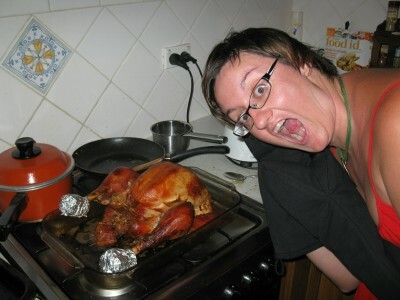 It is the first time I had cooked a turkey and therefore was happy to make a turkey of myself in this photo. Chinese Whisperings is offering a free downloadable PDF of the first two stories in The Red Book (which includes my story Mercurial) until late Christmas Day. If you want to snaffle a copy follow this link through. 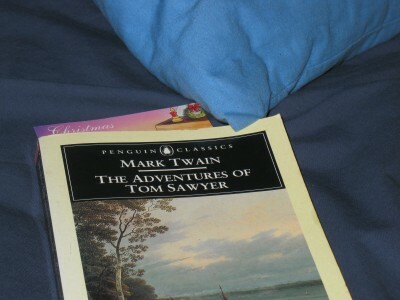 If you don’t have time to read now, save it and enjoy it after the Christmas rush. Last month, my wonderful friend and mentor, Edwina Shaw, had a short post on her blog about waiting. For me the wait is over – my Christmas story Bondi live on the 12 Days of Christmas site. The 12 Days of Christmas is a collaborative project based on the lines from the Christmas carol, The Twelve Days of Christmas. It is the creative brain child, of the amazingly talented Jim Wisneski (you can read a great interview with Jim on Jon Strother’s website to do with the creation of the project). Not only can you read the stories (for free) on the blog, the final collection of 24 stories will be available in paperback and you’ll also be able to buy a t-shirt! The call to action came during NaNo via a RT from the beautiful Emma Newman (whose ten lords a-leaping goes live later this week) and I should have said no. There were only two spaces left when I looked and neither really jumped out at me. On top of NaNo, there was a 1st Dec finish date for Chinese Whisperings and 4th Dec finale for Fourth Fiction. More writing and projects than one woman alone should be able to sustain. But I said yes, jumping into the dark abyss of ‘no idea’ with the prompt Seven swans a-swimming under my arm. The end product, is possibly my best work to date and I am immensely proud of it. It was a difficult thing to do, being the end of November when I had the first whopping great draft of 6,000 words and I had to do something I NEVER do. I put a shout out through Twitter and Facebook for beta readers, given Paul was busy with work, Annie wasn’t in the country and Ben, along with many of my other writing friends, was flat out nailing the last bits of NaNo and then recovering from it. Thank you Edwina, Jen, Rob, Diane and Rebecca. Also thanks to Scott for the idea of the Sydney Swans as the swans in the story (it’s OK – that’s not actually a spoiler) and to Claire Halliday for sharing her rant about busking on Twitter – the list of paper work is the actual list given by Claire (as yes she gave me her permission to use it!). I gave the daughter Claire’s name in honour of the gift of this life insight and the rest of the story grew around it. So, I unveil the first few paragraphs of my story – but for the rest, you will have to hit the Read On link and whiz across to blog specially set up by Jim for this project. And if you do, please leave a comment, however small, to let me know you’ve dropped by. I look down at the pile of paper sitting on the kitchen table and the list Claire has prepared. My shoulder starts aching. “You need all of this?” I’m in utter disbelief at what she’s presented. Claire’s face is earnest and eager. Mine twists into a frown and I try to rotate my shoulder. I admire my ten year old daughter’s thoroughness and organisation. Claire is her Matthew’s daughter, despite the dark curls and amber eyes inherited from me. In the past year I’ve barely been able to scribble a simple shopping list, much less ensure I get everything on it. He should be helping her through this, not me. I don’t want to rain on her parade, but I’m appalled by the fact she needs a council permit, written proof of ten million dollar public liability coverage, written approval from the local traders association, shops and residents just to play some bloody Christmas carols on her flute to raise money for UNICEF. But I owe this to Claire–to jump through these paper-trail hoops, so on behalf of ‘All Ye Faithful’ she can bring some ‘Joy to the World’. “The problem is the public liability cover.” She points to it, highlighted in bright yellow on the list. 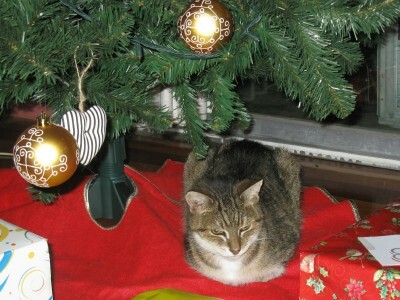 Our cat Keats has taken to sleeping under the Christmas tree on the material which hides the bottom. He looks like he needs a ribbon, or bow, or red nose? The weather was cool enough today to warrant putting on the oven. Mum showed Dylan how to make short bread and delivered to my biscuit tin, two mouthwatering trays of the golden delights. Shortbread is my favourite biscuit outside of choc chip. 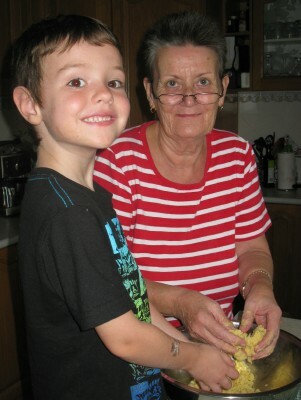 It nudged me in interesting placed to see the two of them make it together and to listen to Mum (who would never let me in the kitchen to bake with her as a kid) tell me how wonderful it is to be a Nanna. Sylvie knew she was staring, but a magnetic pull stopped her from being able to tear her eyes away from his face. She almost said she wished saving her was his every-day gig, but she stopped herself and the words came out instead as a choking sound, then a cough, followed by a fit of sneezing. When she had composed herself, she dared to glance across again as she rubbed at her nose. The stark moonlight illuminated his features and he appeared to be oblivious to her intense scrutiny, concentrating on driving, so she didn’t try to look away. Her body zipped and tingled with electricity, as though the interior of the car was alive with static. Separately there was nothing spectacular or beguiling about any of his features, but the manner in which they were assembled was a masterpiece. Once she’d read beauty came from symmetry – perfect balance. She didn’t believe in God or any particular religious dogma. Her pagan leanings and her love of the Goddess came more as part of her midwifery practise than an actual personal decision to pursue any path of belief. But something pulled at her when she looked at Marcus. In that moment, with his beautiful face in profile, serene but serious, staring out into the hostile nothingness, it was easy to believe something divine had had a hand in creating him. Or she’d just been sequestered away from men too long, yearning for love and the quiet simplicity of a life beyond The Underground. Trina had always said she could put a fantastical spin on anything given half a chance. But in those days she was conjuring fairies, not heroic demi-Gods in mustangs. It was the hands though, that did it for her when she finally looked away from his face to the rest of him. They were long and elegant, tapered fingers wrapped around the steering wheel, but not white-knuckled with the pressure and stress which hers would be. Despite the sub zero temperature, he wore a crumbled grey t-shirt which showed his muscular body to good effect, but Sylvie got the feeling he couldn’t have cared what he looked like and was totally oblivious to the effect he was having on her. And he didn’t seem to feel the cold. A large tattoo ran the from beneath the sleeve of the t-shirt down to the tip of his elbow. In the low light she couldn’t make out what it was and didn’t feel it her place to ask. She didn’t want to make it any more obvious she was opening staring and taking stock of him. He turned and didn’t just look at her, but into her. The clouds, from the building snow storm, swallowed the moonlight and the interior of the car was encapsulated in darkness again. Marcus’s eyes glowed briefly and he turned away. Pulling at the waist band of her hoodie, Sylvie looked down at her lap embarrassed to have been caught openly gawking at him like a smitten teenager. She almost wished for another embarrassing sneezing fit. Leaning back into the seat of the car it seem to mould around her, shifting to embrace her rather than some stuffing giving way to her greater weight. It made the hairs on the back of her neck want to stand up, but she wasn’t scared; something instinctive in her telling her to pay attention and to stay vigilant, but to stay calm as well. Her mother had told her to never believe everything she saw and to question everything. Fantastical thinking got you know where in the real world. The landscape outside raced past in a blur; tumble-down high rise buildings, smaller collections of what looked to be adobe styled houses and wide open spaces of nothing which felt even more foreign in the middle of the city. Finally a wall appeared and Sylvie braced – the memory of her own brush with a wall fresh, like the blood drying on her forehead. He drove around the perimeter of the wall once and then stopped, the engine roaring one last time before quietening to an idle and then stilling. As Sylvie went to get out, the clouds shifted again and a shaft of moonlight caught a diamond-like trinket hanging from the rear vision mirror and she lent across to touch it. Rather than a trinket it was a belly ring, a graceful silver bar with a dangling line of diamonds ending in one large one, tied to a length of cord and then to the arm of the rear vision mirror. It swayed and turned, like a tiny, barely lit mirrorball at her touch.